You wouldn't buy groceries without first checking the refrigerator to see what you have. The same should hold true for compute capacity. Most companies are cloud by happenstance because of acquisitions by the business and IT itself working around the Ops team. Join Jeanne Morain and special guest Paul Mansfield, CTO as they provide guidance on best practices principles for determining service workloads and migration strategy. Cloud architecture, strategy, and implementation are all impacted by security and compliance guidelines and postures. What are the best practices for Cloud approach? How does it impact your security, cost, and other frameworks within IT? Join special guests - Jo Peterson, Chuck Price, and Alvaro Gonzalez for a lively discussion on "Cloud" approach and identifying underlying implications to consider..
Industry terms are overused like Kleenex and Coke. What is the difference between Hybrid Cloud, Multi-Cloud, and Software Defined Data centers? How does your workload affect which strategy you take? Join special guests - Jo Peterson, Michelle Ruyle, and Lisa McLin for a lively discussion on the proper "Cloud" approach. The era of multi-cloud is upon us, and with it comes a flurry of new opportunities for tech teams and data centers alike. Not only does a multi-cloud approach provide more flexibility within your public cloud environments, but can also prepare your data center for an AI-ready cloud infrastructure. Join this live panel discussion with renowned cloud and data center experts as they take a closer look at how to properly design, plan and build a multi-cloud strategy, what it means for your data center, and how it intersects with AI and operations. Tune into this live panel discussion and start building your enterprise architecture roadmap for 2020 and beyond. 2017 was a historic year for women and feminists around the world. With the #metoo and #knowno campaigns, gender gaps and disparities were brought to light in ways they hadn't been before. Now it's a new year and with it comes new challenges for women in hi-tech careers: whether it be navigating your career through these times, finding or becoming a mentor, building your personal and professional brand as a leader, dealing with office politics or maintaining work-life balance, the challenges and opportunities for women in the workplace are endless. Join this expert panel with moderator Jeanne Morain and panelists Emerald de Leeuw, Executive Director, EuroComply Data Protection Technology, Jill Donahue, Sr. Director of Marketing, PC Connection, and Andrea Short, Director, Supplier Marketing at Tech Data. They will share personal stories and experiences, tips and best practices, problems and solutions around these and other topics for women in tech leadership. Last week it was uncovered that an intern at Apple leaked some of the iPhone's source code was leaked on GitHub. The code was for iBoot, a component of the iPhone's OS. While it was an older version of iOS 9 and Apple has declared the leak shouldn't be of concern to the average user, the community has been scratching their heads wondering how sensitive code from a conglomerate like Apple could accidentally be made public. We hear about data leaks and security breaches almost on a weekly basis now, but when it comes to something so widely used by global consumers, it poses an even bigger concern that human error could potentially have disastrous results. Join this expert panel with moderator Jeanne Morain, Digital & Cloud Strategist, iSpeak Cloud, and panelists James Jardine, CEO & App Security Consultant, Jardine Software, and Don Cox, Advisory Board Member at Netswitch Technology Management and Virtual Rehab, Inc.
- What are the potential ramifications of such a breach? - What are action items companies can do to prevent such a breach from happening? The containers and microservices industry has exploded in recent years. With companies like Docker blazing the trail, we've seen a huge expansion in the application container market with other open source platforms like Red Hat, Mesosphere, Kubernetes, CoreOS... and the list goes on. However, when it comes to major mergers and acquisitions, the containers market hasn't been high on the list of deals. It was recently publicized that Red Hat is acquiring their fellow open source vendor CoreOS for $250 million. This deal will allow them to expand their share of the Kubernetes market and enhance their Kubernetes software management. What does this type and size deal mean for such an emerging market? What are the possibilities, potential, and even ramifications for application container, cloud application, and cloud infrastructure providers? Tune into this expert panel with Jeanne Morain, Digital Transformation & Cloud Expert, iSpeak Cloud, Jay Lyman, Principal Analyst, 451 Research and Chris Haddad, Chief Architect, Karux LLC as they discuss these and other pertinent questions in the tech M&A marketplace. Though the media spends much more time covering consumer startups like Uber and Twitter, enterprise startups are the ones that have delivered consistent and significant financial returns over the last decade. From companies like Nutanix in infrastructure, Splunk in DevOps and Palo Alto Networks in security, there are many great career opportunities in enterprise tech for women that include but are not limited to engineering. This special panel will provide insights about careers in enterprise tech from moderator Jeanne Morain, Principal Researcher/Strategist, iSpeak Cloud, and panelists Erye Hernandez, Sr. Malware Researcher, Palo Alto Networks, Tiffany To, Chief Operating Officer of ForAllSecure, and Karla Zarate, Top Engineering Grad. These panelists will share their own career paths, skill sets required for different enterprise tech career paths and some of the challenges they've faced and how to overcome them from a WIT perspective. Webinar will be live on November 15, 2017 at 10:00 AM PST and available for post recording downloads. Got DevOps? Whether you are just starting or down that pathway you will inevitably get hit by the Data Dilemma. Although you can spin up a container or VM in minutes the dependent data store could take hours, weeks or even months depending on the process. When 4 out of 5 requests require updates to the dependent data store - your DevOps velocity can slow to a crawl. Join special guests Robert Reeves and host Jeanne Morain as they provide prescriptive guidance for solving the DevOps Data Dilemma. According to Pulse, over 84% of Digital Transformation efforts are failing. Companies are worried about how they balance legacy systems while keeping pace with new nimble players in the Cloud Era. How do you overcome the traditional silos between IT and the business to achieve success in Digital Transformation? What are the challenges politically, technically, and operationally that need to be overcome to turn your cloud vision into transformation reality? Join our host Jeanne Morain, Author & Cloud/Digital Strategist and her special guests Aditya Vasudevan, Co-Founder, appOrbit and Chris Orlando, Co-Founder & Chief Sales & Marketing Officer, ScaleMatrix, as they explore the top 5 challenges and solutions both they and/or their customers have faced to achieve success in Digital Transformation, both from an IT and a business management perspective. Many fortune 200 CEOs are considering a bold move to all "public" cloud or virtual private cloud environment. How do you plan a successful migration to AWS? Join Jeanne Morain with special guest Roger Eisentrager as they way the pros and cons on their cloud migration journey. Are you at risk of a multi-million lawsuit like Mars Candy, City of Denver or Anheiser Busch? The cloud provides many benefits for the Enterprise but when implemented unchecked could result in millions in fines and risks. Join Paul Doc Burnham from ServiceNow and Jeanne Morain as they provide prescriptive guidance on how to get ahead of your license risks before you migrate. Security and compliance standards for IOT are top of mind as viruses such as Marai plague unsuspecting devices. Join Jeanne Morain and special guests Christ Armstrong Teknow Consulting as they provide insights and solutions to secure IOT devices on your cloud infrastructure. There is a lot of hype in the market about how you identify and determine the right mix of service workload to the right environment. Don't waste valuable time and money on solutions that will not solve your migration challenge. Join Jeanne Morain as she provides an overview of simple steps that will save you both time and money when making the leap from Legacy to Cloud. Are you tired of being caught up in the latest technology Hype Cycle - wasting valuable time and resources? 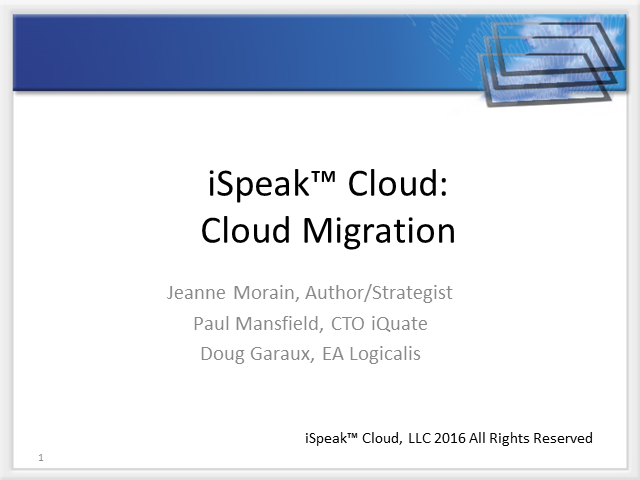 Join Jeanne Morain (author of highly acclaimed Visible Ops/iSpeak Cloud) and her special guests for the monthly iSpeak ™ Webcast Series as they cut through the information clutter. The series will provide insights and best practices from industry thought leaders on current trends and truths about the state of IT Infrastructure Landscape from Big Data to Cloud. The series will consist of 2 panel members that can provide a balanced perspective and real world examples of key challenges Enterprise IT faces today when combining these newer technologies with their legacy system environments.